If you’re new to it, ASP.NET MVC can prove really difficult to learn. Sometimes it feels like even the simplest of tasks (showing text in a textbox) turns into hours of research, conflicting opinions and seemingly endless libraries to choose from. It’s easy to feel defeated before you’ve even begun but fear not, to show data on a page using MVC you actually only need to know a few key concepts. This post refers to ASP.NET Core MVC but largely applies to earlier versions of MVC too. I find it really helps to start with a mockup of the thing you’re trying to build. No matter how small or trivial the feature is, try sketching it out first. You can use a whiteboard or pen and paper to do this. 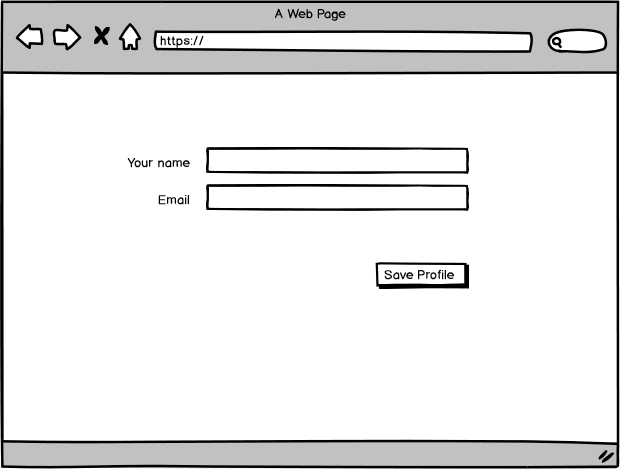 There are always online tools like Balsamiq Mockups that make it easy to build up mockups using pre-built components. And remember it pays to keep things simple when you’re just starting out. Yes, we could easily add more fields to this profile and consider fancier features like profile pictures etc. But remember the aim is to get something working as simply as possible, and to improve your understanding of MVC as you go. You can always visit it again once you’ve got the basics working. Generally speaking, when you want to render anything on the screen using ASP.NET MVC you’re going to need three things (and the clue’s in the name!). A Controller, View and ViewModel. This applies whether you want to show text, a textbox, dropdown list or anything else. 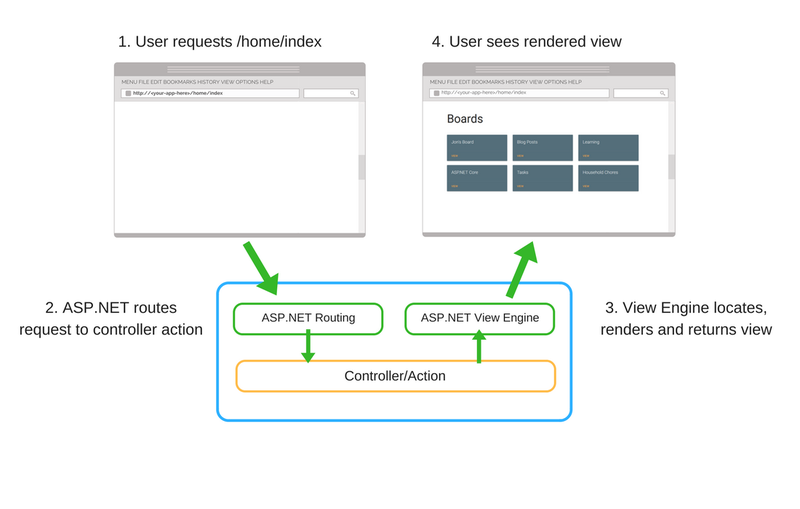 When a user requests a page on your site, their request is sent to your application and forwarded to a Controller (specifically an Action on that Controller). The action then returns a result (typically a View) which your user sees in their browser. A simple controller action might look like this. In this example we have a UserProfileController with a simple Index action. Using ASP.NET MVC’s default routing setup, your users will end up here if they navigate to this URL. This url consists of the controller name (userprofile) and the action (index). Or indeed you can skip the index bit because ASP.NET Core’s default routing will try to go to any action called Index by default. The action itself is about as simple as you can get, it just returns a View. If you try to access a controller action and haven’t created the corresponding view you’ll get a handy message. In this case ASP.NET expected to find a view called Index.cshtml (and looked in a couple of places to find it). This error points to our next step. If we add a new view to the relevant folder (UserProfile) MVC will spring into life and return that view when we hit our controller action. Not very inspiring, but ready for us to add something more relevant to our feature. We’re ready to show data in our View but how do we get it there? The magic glue that binds all of this together is the ViewModel. A ViewModel is really just a class with some properties which contain information you’d like to display in your view. Anything you want to show on the page will need a matching property in the ViewModel. Now to use this ViewModel in our controller. We can easily return an instance of this EditUserProfileViewModel along with the View. 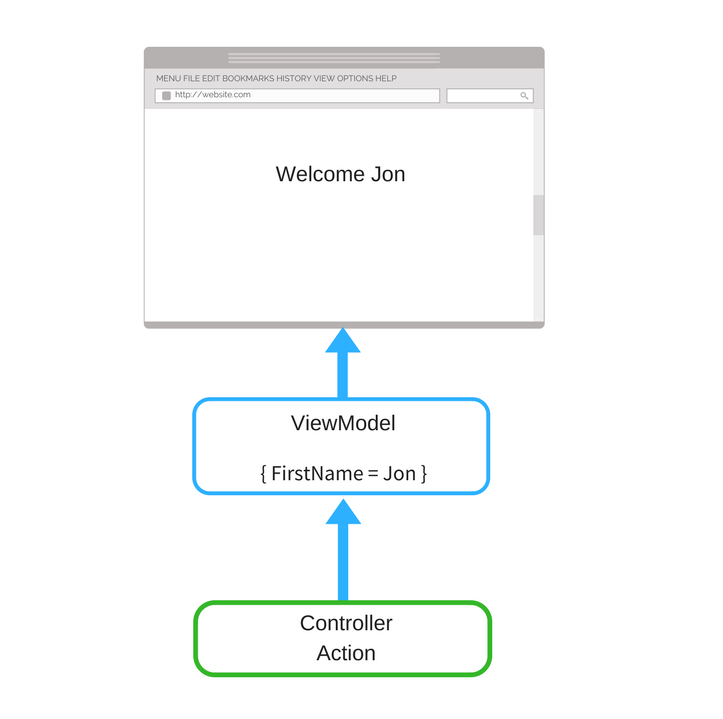 When learning MVC it’s useful to stick to hardcoded data (like “Jon Hilton” here); hardcoded data makes it much easier to throw things around and change your code as you learn new concepts. This is all well and good, the controller returns a ViewModel, the ViewModel includes someone’s name and email. We need to inform MVC which Model we’re expecting back from the controller action and to do that we’ll need to add a @model reference. This generally sits right at the top of your View. But what about those text boxes we saw in the mockup? New to ASP.NET Core is the concept of tag helpers which let you easily bind your HTML elements to properties on your ViewModel. The ASP.NET Core MVC starter project inclues Bootstrap, so your next step would probably be to use that to add a few labels and lay your form out to reflect the original mockup. Next you’d probably want to send these values back to your application. For that you’d need to employ a form, this article walks you through using a form and Tag Helpers to post data back to your application. Have a go yourself, you’ll find it much easier to learn that way. Finally, if you want to see exactly how to build a real application using ASP.NET Core MVC, try my course Practical ASP.NET Core MVC.